It’s quick and simple to park at London Southend Airport. Each of our official on-site car parks is just a few minutes’ walk from the terminal – with no need to wait around for shuttle buses. They’re safe, secure and open 24 hours. Better still, you can make amazing savings when you pre-book online. So you can simply drive up, park up and take off... without being taken for a ride. In order to guarantee your space and secure the best price we strongly recommend that you pre-book your parking There are 3 car parks to choose from when pre-booking, all just a few minutes’ walk from the terminal, with no need to wait around for shuttle buses. Whether you are away on business or leisure, staying for 1 day or 2 weeks we have options for everyone. To pre book your parking for any of our Long Stay car parks just enter your dates and pick the right car park for you. Our most conveniently located car park. It is opposite the terminal and is just a minutes’ walk from check in. This car park is just a couple minutes’ walk to the terminal so is perfect for those looking to combine convenience with cost. Our best value parking option, this is only a 4 - 5 minute walk to the terminal. To guarantee a space in our car parks we recommend that you pre-book, however we have numerous parking options for those that want to just turn up on the day. We have spaces for those who are dropping off and picking up or you can park in any of our car parks whilst you go away. When turning up simply take a ticket at the barrier and pay at any one of our Payment Machines, either in the car park or in the terminal building. There are a couple of options for those who are looking to pick passengers up or drop them off. Our conveniently located Short Stay car park is just a few steps from the terminal, so it’s the best option to get passengers as close to the terminal as possible. The first 5 minutes in the car park are free, and there’s no need to pre-book. If you need a little more time you can use our Long Stay 3 car park where the first 15 minutes are free. There are conveniently located disabled bays in our Short Stay car park for picking up and dropping off as well as in Long Stay 1 and Long Stay 2 for when you are pre-booking. If you need help getting to or from your car, please contact the airport before you travel or press the assistance button on the barrier prior to entry. Please note that a free period of 5 minutes is allowed for drop-off/pick-up in the Short Stay car park however if you require a longer time just speak to our team via the assistance button upon exit. For pre-bookings, Long Stay 1’s disabled bays are closest to the terminal, with the shortest distance to the check in concourse. If you have booked one of our Flexible products, you are able to amend or cancel your booking up to 24 hours before you are due to arrive without any cost. Our Non-Flexible products are non-cancellable and non-amendable. I’ve pre-booked my parking, what happens when I arrive? When you arrive at the car park your number plate should be recognised by our ANPR technology and lift the barrier for you. However, in case there are any issues, we recommend that you have your booking reference to hand just in case you need to speak to a member of our parking team who will be able to find your booking and let you in. How safe are Southend Airport’s car parks? All of our car parks are very safe and have all received ParkMark accreditation which means both ParkMark and the Police have signed them off as being safe and secure places to park your car. They are well lit and our on-site parking team do regular patrols. What happens if I am late or early to the car park or my flight is delayed on my way back? We understand that people can’t always arrive at our car parks exactly when they say they will, which is why we have a 4 hour grace period either side of your pre-booked entry and exit times. However if you overstay this grace period, you will be subject to our overstay charges, charged at the 24 hour turn up rate in each of our car parks. Can I book parking for the same day I am travelling? Yes, you can book parking up to 2 hours before you are due to arrive at the airport. However, to guarantee availability and to secure the best prices we recommend booking early. 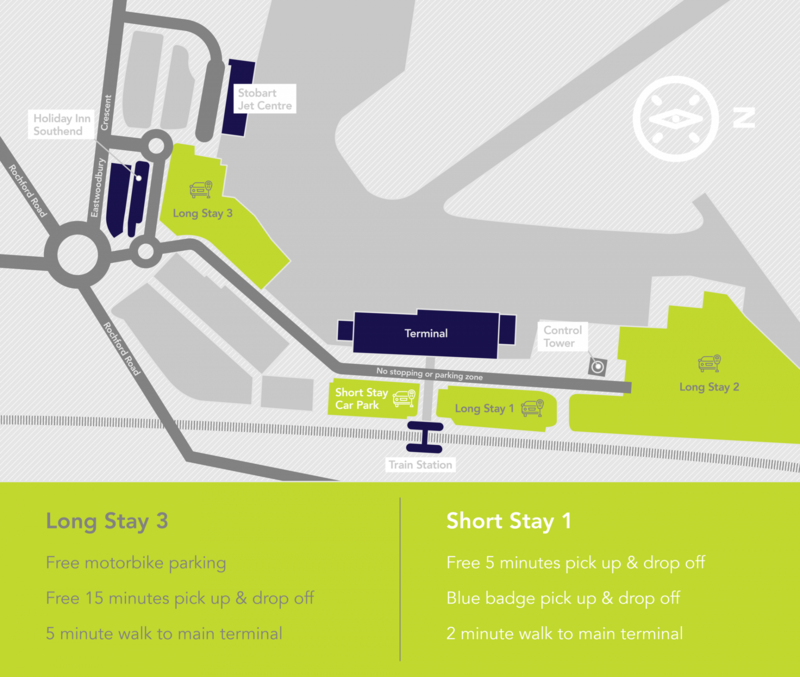 For more detailed information about Parking at London Southend Airport please refer to our terms and conditions.